But some residents are not buying it. The land in question is nearly eight acres between 16th and 18th Streets, along Newberry and Peoria Streets. The project would contain 465 one, two, and three-bedroom units, ranging from $1,000 to $3,000 monthly rentals. It would be completed over five years and be constructed in three phases, according to project head Gottlieb. There would also be 10,000 square feet of retail space. Now it wants to move into Pilsen. Solis and the Pilsen Land Use Committee (PLUC), a neighborhood group created by Solis to vet development proposals in the neighborhood, have prevented the developer from building on this property since PMG started the process of buying the vacant land in 2013 from the Midwest Jesuits, a Catholic order that also operates St. Ignatius High School and Loyola University. PLUC and Solis shot down PMG’s first 500-unit proposal in spring 2015 on the grounds that the project would be too densely populated and would not meet Pilsen’s twenty-one percent affordable housing mandate. The mandate, formed in 2005, states that any new development of eight units or more that requires a zoning change must reserve a minimum twenty-one percent of its units for affordable housing. The number is unique to Pilsen—every other neighborhood has a ten percent requirement. The idea is to encourage more affordable housing and stem the exodus of residents who can’t afford to live due to rising rents and property values. The mandate is not legally binding and developers can gain the favor of the PLUC and other groups by offering comparable benefits to the community instead of affordable housing. For instance, the PLUC and Solis approved a ninety-nine–unit building with only ten percent affordable housing in February 2016 after the developer promised to donate an acre of land to the nearby Benito Juarez Community Academy for an extended sports field. PMG’s latest proposal could be its ticket to start building. The developer is hoping that a new package of community benefits will win over residents who oppose the project. “ParkWorks’ new plan exceeds the community’s request for affordable housing, green space, job creation, and support for local businesses,” according to a PMG video about the project. Gottlieb is promising that two-thirds of property employees will be Pilsen residents, along with one-third of retail employees, and “on-site hiring for local construction jobs,” according to the video. 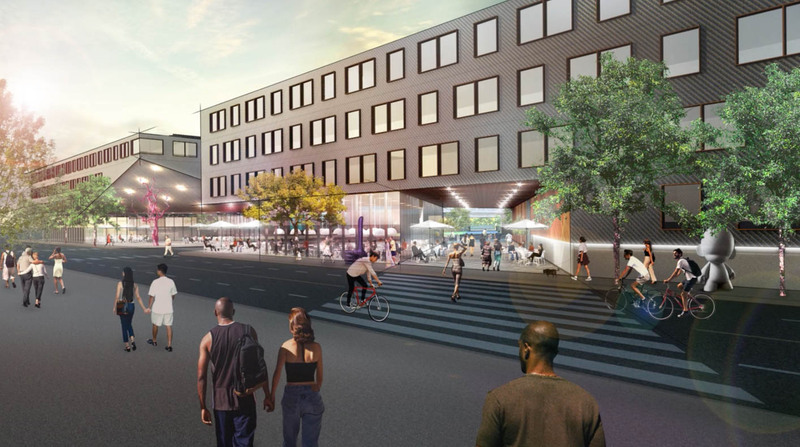 According to Gottlieb, the project will create sixty jobs for Pilsen residents, though ten of them will be for construction, and only some will be full-time. The community’s largest concern seems to be with the promised affordable housing. The developer is claiming that it meets the twenty-one percent mandate of affordable housing, but there’s a large caveat: while some affordable units will be on site, others will consist of existing apartments in Pilsen that PMG will buy from residents, with promises to implement rent control for thirty years. In order to meet the mandate, PMG will have to extend its footprint further into the neighborhood by buying up more property. 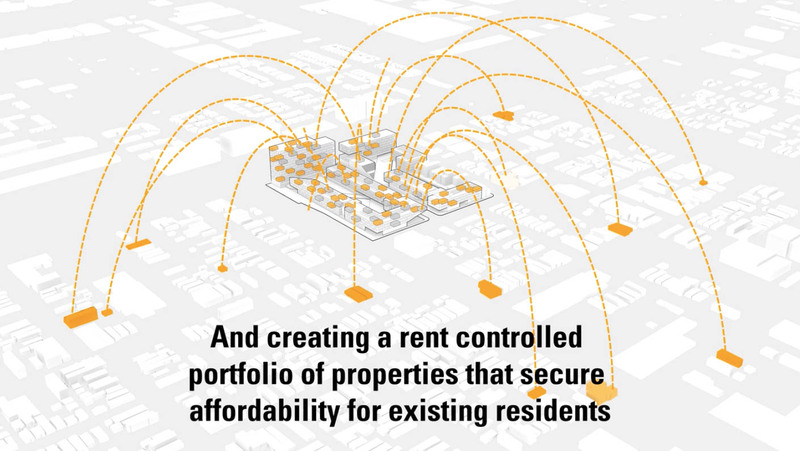 A screenshot from a PMG promotional video for ParkWorks shows a visualization of its plan to spread its affordable housing obligations throughout Pilsen, which critics say would expand its already-sizable proposed footprint in the neighborhood. For PMG, promising affordable housing by buying up existing Pilsen property and imposing rent-control on it is a way to meet Solis and the PLUC halfway, but its language is vague and leaves wiggle room. For instance, it is still unclear what portion of ParkWorks units will be on-site versus off-site. Gottlieb has said that the twenty-one percent on-site rule is unfair to him as a developer and the neighborhood in general. One of Gottlieb’s posters at his May community forum claimed that private developers have built zero affordable units in Pilsen since the twenty-one percent mandate went into effect. This claim ignores projects born from private/public partnerships, such as Casa Querétaro and Casa Maravilla, which provide hundreds of affordable units housing to seniors and families in Pilsen. Gottlieb and PMG have framed their new proposal in terms of “social responsibility,” promising to bring more good than bad to Pilsen, but it’s unclear how that will play out in the long term. For one, PMG has a record of selling their buildings to third parties as soon as it’s profitable for them—PMG’s founder said as much in a 2013 interview with The New York Times. His words, however, run contrary to the modus operandi of his company. In January, PMG put its Logan Square building up for sale. Known as the “L,” it was built in 2016 after years of planning and community debate. The building that was initially proposed to the community was altered to be smaller and meet the neighborhood’s affordable housing concerns, not unlike ParkWorks in Pilsen, after residents protested that it would be a gentrifying force in the neighborhood. Gottlieb was the project’s senior manager. PMG has also expressed interest in the University Village and Pilsen area before. In March 2015, PMG played a role in buying and demolishing the Gethsemane Church, which stood for over 140 years at 13th and Union, to make room for an upscale apartment building in University Village. They secured a building permit earlier this year. For some longtime residents, however, the promise of retail jobs and rent-controlled housing does little to offset the concerns of the gentrification they feel ParkWorks would accelerate. Underneath the arguments over the details of the proposed development and the fight for zoning rights is a deep mistrust residents feel toward a developer who promises to make only positive changes in their community. A rendering of the proposed ParkWorks development—a large, futuristic looking building—sharply contrasts with the 18th Street of today, which hosts some of the city’s oldest housing stock. Eastern Pilsen has already seen encroachment from higher-priced buildings of University Village to the north. ParkWorks is just the latest, and by far the largest, example of gentrifying development in this part of the neighborhood. At 917 West 18th Street, across the street from ParkWorks, a new office-loft space attracted media attention in January when its developers gave it the ill-suited name “The Gentry,” which smacked a little too truthfully of the gentrification of which the building was a part. The developer, Villa Capital Properties, changed the name after receiving negative feedback. The planned “Paseo Trail,” a 606-style four-mile trail on old freight tracks that runs alongside the ParkWorks site, is likely the greatest gentrifying force there today, with the potential to bump up property values in the surrounding area and attract more moneyed outsiders. Community groups resisted the 606 trail on the North Side, arguing that property values would increase and gentrify the areas around the trail, and those fears were well-founded. Property values of single-family homes within a half mile of the trail increased by fifty percent from 2013 to 2016, according to a study by the Institute for Housing Studies at DePaul University. “People living here, it’s poor people,” said Bernadino Echeverria, a resident and Pilsen Alliance member. His main concern is that ParkWorks targets middle class prospective buyers from outside Pilsen, and that their entrance into the community would force out the Latinx community as rents inevitably rise. For him, keeping the developer out would help preserve the neighborhood. “We want to keep the community together,” he said. Ultimately, the future of the development and the surrounding neighborhood rests with Solis, who has the power to go through with PMG’s proposal or refuse it again. Many members of the Alliance expressed the belief that Solis is too close to developers and puts his own agenda ahead of Pilsen’s. Some members of the Alliance pointed out that PMG donated $2,650 to Solis’s reelection campaign in 2014 and another $2,700 to his ward organization in 2015, and were worried this meant Solis could work out a backroom deal and allow the development to proceed. At the June 7 forum, Sigcho was critical of what he saw as the developer trying to preemptively get the green light through Solis without the community’s input. “Being at the table after the fact is not the same as sitting down and saying, ‘This is the situation,’” Sigcho told Gottlieb, standing among a group of residents. The impasse is worrisome for residents who fear change in their neighborhood, and explains the energy being funneled into this dispute over eight acres of unused land in eastern Pilsen. But perhaps what this fight has proven is that this is not just about resisting change in a community but also about retaining the power and voice of residents. This is my first experience reading South Side Weekly, and while I’m impressed with the quality of the writing, why are people with overtly racist views given a platform here? I suppose this is more journalistic than calling my residence an “encroachment,” but surely the racist few don’t deserve an entire paragraph dedicated to their views. No mention of the fact that Resurrection Project CEO Raul Raymundo is also the chair of PLUC? For an article that’s clearly very well researched, this is a pretty glaring omission. Gentrification is a sticky issue, to be sure, and there are two sides to everything. I absolutely sympathize with the plights of displaced families, and I agree that the way in which our society in general is structured needs a lot of improvement. It’s unfortunate that the anti-gentrification side harbors (and almost encourages) vocal racism like the above quote and allows potential corruption — I’m not sure how else to view the fact that the CEO of a real estate developer is also the chair of a committee given the power to govern real estate development. If there’s some other way to interpret that connection, I’m all ears. Prof. Betancur’s perspective is the most encouraging in the whole debate, in my opinion. Communities, cities, neighborhoods, people, etc. are all constantly changing, and there’s no “perfect” development for this plot of land. Whatever goes here is going to involve a certain amount of compromise from both sides. And while this article seems intent on portraying PMG in a negative manner, they’ve at least shown their willingness to compromise, with revised plans, community meetings, etc. This is in stark contract to Solis’s office, as the article demonstrates: “There is nothing for us to talk about; we have two different positions.” And that’s the most unfortunate part of all of this to me, because a couple of giant empty lots benefit exactly no one.